*NOTE* The 1st loop or st directly after the slip stitch can be hard to see and get your hook into. Just work as best you can staying in the count limit. You can also just look behind at the loops and count from the left over to the right and you can find the “hidden” back loop. Rnd 13: Working in Front Loops. SS in next dc, SS in FL of ch1. Ch1, in same loop work 3SC. [1SC in FL of 25sts, 3SC in FL of corner ch1] 3Xs. SC in FL of last 25sts. Join to 1st sc. 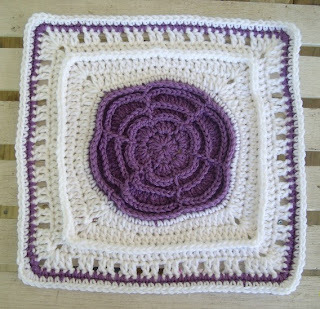 ~May 2011 Square~ is from my, “12 Squares in Time” year long series on my blog. If you like this square, please visit my blog to see more of the monthly squares. © Copyright 2011 Aurora Suominen All Rights Reserved. Love this square, it is awesome. Thanks for sharing. OMG!! You have outdone yourself on this one, girl!! Absolutely gorgeous!! Love the texture on this! What a pretty square. Are you making a ghan with lots of these? 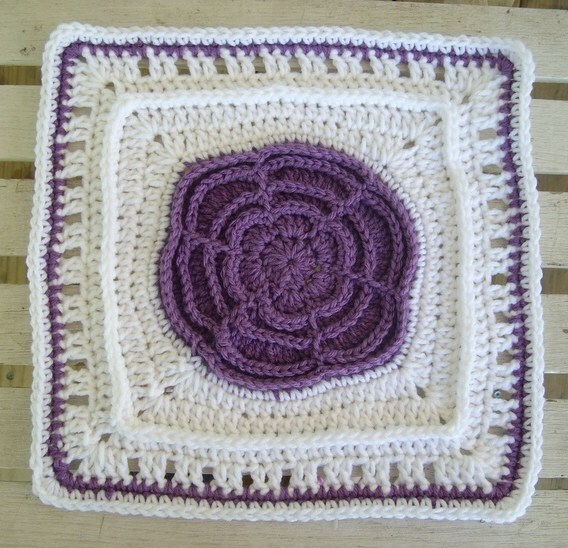 Or a ghan with lots of different squares? What a marvelous Square this is! I love it more as May is my birthday month! Thank You for sharing this magical pattern.